Details: Ensignbus service vehicles have recently started gaining fleetnumbers. Perhaps because the bus fleet features numbers up to the 700-series, the support vehicles are numbered from 801 upwards. 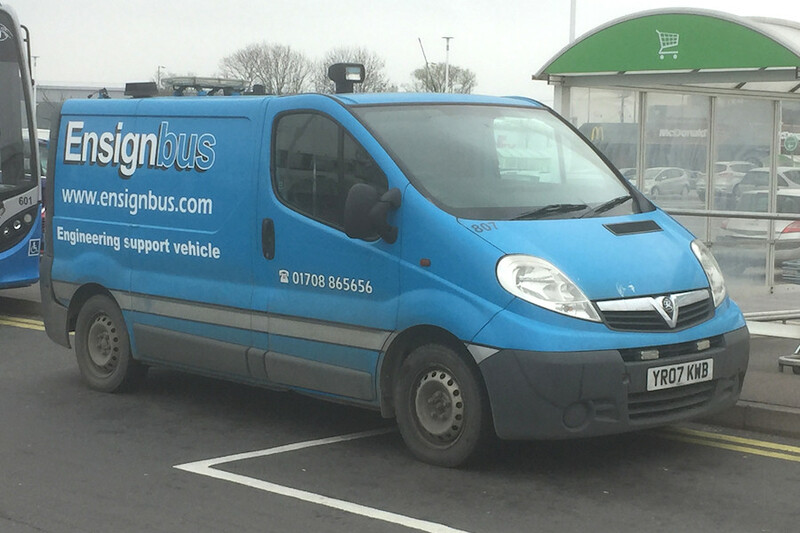 Seen at Tilbury Asda on 2nd April 2019 was Vauxhall Vivaro van YR07KWB, now numbered 807. The device sticking out from the roof is presumably a spot-light, though of a non-standard design. It was fitted when the van was acquired. Reports of which vehicles carry fleetnumbers 802, 806 or anything from 809 upwards would be welcomed.